Fitness machine such as treadmill has become a crucial aspect of building our body and having a healthy life. Having a treadmill is a good thing, but can you imagine if you only need to buy one item for many exercises? Yes, that would be awesome. Now that thing is possible because of Nordictrack Freestrider. This item does not only work as a low-impact treadmill, but also an elliptical trainer and stairclimber. You can focus on much different minor muscle training in this fitness machine. Its design is intended for minimizing the risk of injury as much as possible. You can see there is a long stride range in its device which will help you in your training. Nordictrack also offers us numerous training program which makes the fitness easier than ever before. You can experience dozens of built-in programs which is specially designed by the iFit company. There are tons of things that we can talk about this machine, so if you want to know more about it, let’s see the explanation below. Nordictrack is pretty easy in its usage. The treadmill has the modern setup which can save your time for about one hour if being compared to the traditional treadmill setup. You can sync Nordic to your favorite tablet and use it from your tablet. There are also some important things that you need to consider when using NordicTrack. First, you can see that Nordic is a fine choice if used as the alternative treadmill for the people who wants a vigorous training but doesn’t want to get much stress or even wanting to reduce the stress in their knees and ankles. After that, you can cooperate the machine from its program, picking the best program which you need and getting a different training with the different method. You get so much comfort when using this machine as it gives so many alternatives in term of using it. It provides you the handle-based control and built-in programs which are excellent for the workout. With 32 different programs in it, Nordictrack has already been considered as one of the multitasking fitness machines in the market. The performance itself is easily one of the best in the market as it can give you the highest comfort from its features. You can use the water bottle holder, transport wheels, and it can even download a new customized workout every day. 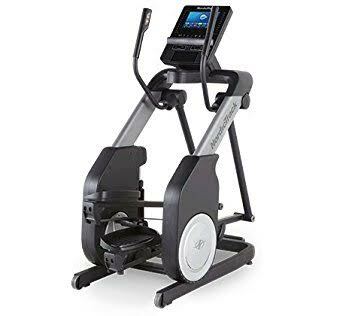 Nordic is easily saving a good amount of your time if being compared to the traditional fitness machine and it also thinks about the user’s safety by adding good features for this problem. Nordictrack Freestrider is easily one of the best fitness machine and treadmills out there. It offers countless benefits like its programs, features, and the training methods. It also has a high standard comfort which will ensure you to get the best mood when doing your exercise. So Nordictrack is definitely worth its cost as it is made near perfect. Check the best price for Nordictrack Freestrider here!